Unknown by origin with vague traces in the past, the true history of Tibetan Singing Bowls is yet to be discovered. Most resources state a mysterious past and only few mention the possibility of being discovered and brought to light by Shakyamuni Buddha and consequently brought to Tibet by Padmasambhava, a powerful Buddhist priest who defeated Bon religion in Tibet. But more than defeat, Bon religion is the native religion to Tibet, as is the Dreaming to Aboriginal culture in Australia, and because Bon religion had strong roots in Tibet with deep insights, values and resources, it became part of Buddhism – the Bon Buddhist path. A beautiful history unfolds and I recommend looking deeper into both Buddhism and Bon, and their consequent merging in Tibet; but the reason for this short explanation is that Bon adopted the use of Singing Bowls for their practices because of their innate power. 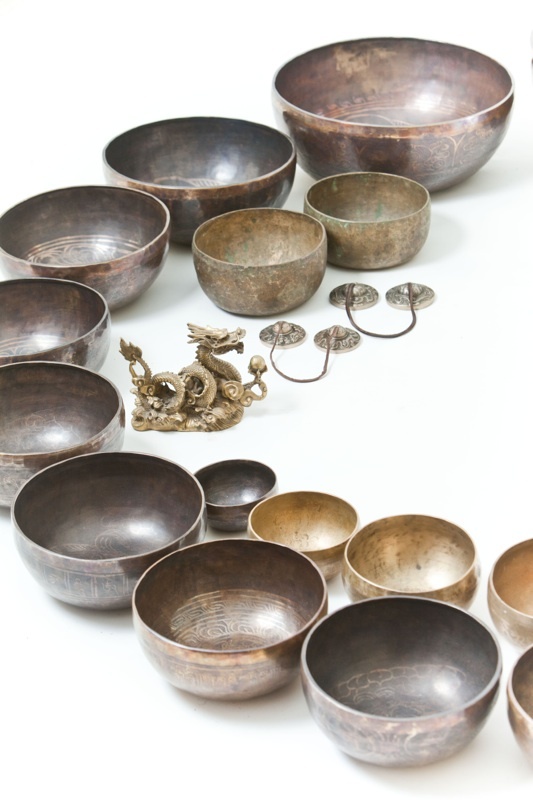 Tibetan Singing Bowls are usually created from alloy of seven or more metals which were available in the metal rich region of Tibet (it is hard to carve a flute with no forests around). While forming the bowl by beating, a set of mantras (sounds based on vibration) was chanted to infuse the bowls with additional energies. Sometimes the bowls come with artist designs depicting one of the 8 vehicles of Buddhist teachings with common “Om” sign or the eye of the Buddha sign in the middle or on bottom of the bowl. 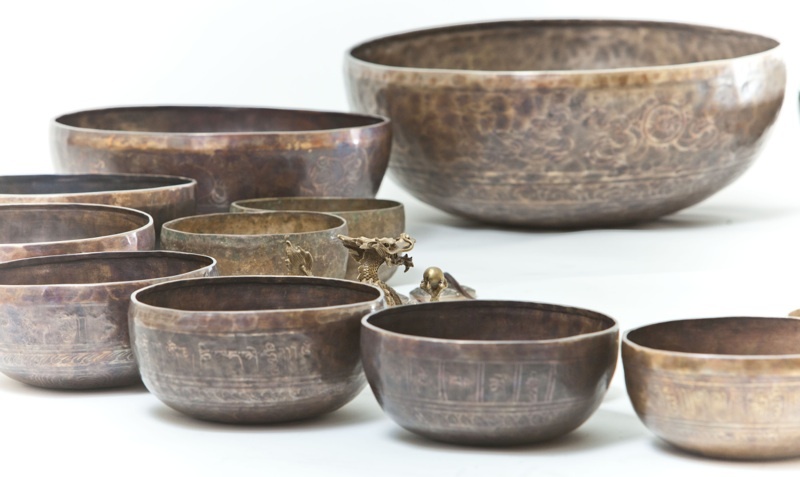 Some bowls have the most chanted mantra engraved on the outside – Om Mani Padme Hum (mantra to help humanity to move forward towards the light as whole). Although these are not necessary for the bowl to work, all additional signs focus the energy flow in a more specific way. Compare it to hanging a beautiful panorama of beach in your lounge – you don’t really need it to be able to use the room, but it changes the feeling of the room dramatically. There are few types of Singing Bowls and different materials used to make them. The cheapest option is a machine made bowl. They look nice on the outside – but if you enjoy driving fast, you can’t travel with a horse wagon. The machine made bowls still offer some of the desired vibration, but from my own experience, it has far less power than a proper handmade bowl. Then you strike the bowl… a humming sound of unknown depth appears around you. Or in better words, you appear in a strange, new dimension where this sound is all around you. With just one strike the teaching, the dharma, opens in front of you. With just one strike? Yes. That is all that is required in order for you to start learning your inner truth – who you really are. This is the main purpose of the Tibetan Singing Bowls and why they were created. Once you find the bowl you like, find a very quiet place where you will be in peace for at least 5 minutes. Then strike the Singing Bowl you are holding in your hand in front of you. Close your eyes, breathe deeply and focus on the vibration. Focus on it with your ears and consequently with every single cell of your body. Focus, focus more, all your intention is to perceive the vibrations. The sound of the vibration becomes very low but you can still hear it. Then you no longer can hear it, but you still feel it with your body, your being. At last, it is gone – and because you have focused all of you on the vibration, suddenly you are not focused on anything – and this is where the strongest teaching happens – the teaching of emptiness. There are many uses for Singing Bowls and although the main purpose is to help you learn about your origin, there are awesome secondary effects you ought to know. Relaxation, stress relief, healing, cleansing spaces, dissolving negativity are just few to mention. Some people use them for healing; I have studied and learned traditional Nepalese Sound Therapy that has been around Nepal for at least thousand years. Imagine – instead for prescription for the newest antibiotics from your doctor – on your visit you just lie down and let the vibration of up to 12 different Singing Bowls help you to realign and relax the body so it can heal itself. A secondary effect is based on vibrations and patterns that bring out the cellular memory all around the body of the original healthy vibration and release all tension that we were not even aware of (inside body too as the vibrations travel throughout the body). Do you remember recent walks in a park where a bush branch scratched your tight? You don’t? Well, your body does. That goes for all physical as much as mental memories – carrying too much worry literally tenses up every cell in the body and unless released, it spells trouble. 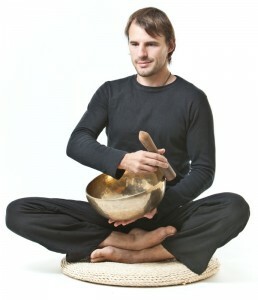 The Singing Bowls bring out the natural, healthy vibration in each cell and releases all these tensions and troubles. A dis-ease note: there are two types of diseases or issues in our lives. The first is easily acquired through accumulation of stress, either physical or mental. These can be released easily with help of the Singing Bowls, or other techniques. Used as a secondary therapy, some of the second type of diseases can too be released, if they are no longer needed for our evolution, but usually the second type of disease is present in our lives to learn and experience this world and all of us need to resolve these. Although it is easier to see clearly after a good sound massage, neither Singing Bowls nor Rei-ki or any other technique is going to take these learning lessons from us. You came here to deal with them yourself. On more technical note, if you play your bowl next to water or if you pour water into the bowl and play it, a pattern of ripples appears in the water. There are some amazing scientific tests done with vibrational patterns and I urge you to look them up. This patterns, based on natural frequencies, are based on sacred geometry – and with the vibration of the Singing Bowls, they start literally appearing inside your body (remember, your body is more than 70% liquid). What happens once all this occurs? From seeing the Buddha and visiting variety of different higher dimensions to a simple sense of ‘I now understand clearly what needs to be done’. The effects are individual, but imagine having a massage that instead of stretching only your muscles soothes your whole body inside out. For practical use, keeping a Singing Bowl in a busy office to bring peace when only stress fills the room in that hard-to-catch 5 minute break, or keeping one at home to bring peace into your soul – those are just few to mention. Radim Cechvala is a healer and fine art photographer. Radim offers healing sessions, sound massage and Napalese Sound Healing sessions are done by donation only in Campbelltown, NSW. For details, healing sessions and more, please visit spiritsofstone.com.au.